Costello (center in glasses, first standing row) with the 814th Military Police Company in Fort Bliss, Texas. 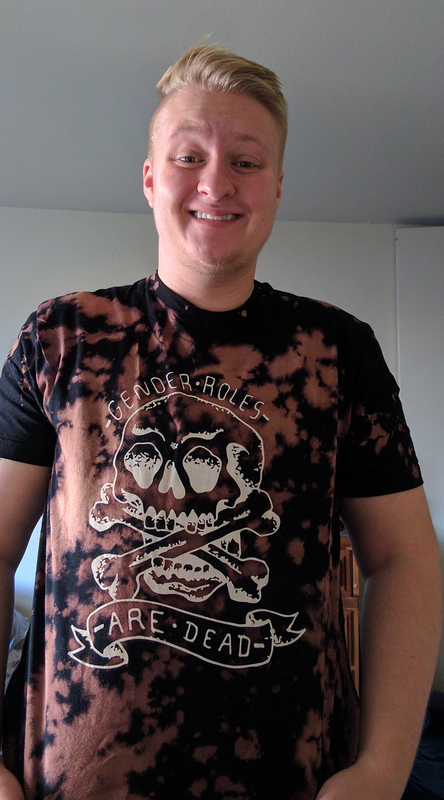 Pushing boundaries is a way of life for Beckett Costello, a Roosevelt University honors student who is a modern-day Renaissance man in the making. Costello switched majors a number of times, delving into history, secondary education, criminology and radiography, before settling into political science at Roosevelt. Throughout that process, Costello also transitioned from female to male. At 22, Costello’s favorite adventure so far in life has been the nearly nine months he spent as a female prison guard at the U.S. Guantanamo Bay detention camp on the coast of Cuba. However, recent high-profile experiences as an Obama Foundation trainee in Chicago and as an intern at the Chicago office of U.S. Rep. Mike Quigley proved just as memorable for Costello who currently interns with the nonprofit organization Women Employed. Growing up in rural Kansas, Costello always knew something inside was a little different, but it never got in the way of getting along with almost everyone in high school. Costello has always had a keen sense of humor. A fan of Oprah Winfrey Network’s Mystery Diagnosis, Costello used to joke that he would one day become one of the show’s many guest patients with a mystery condition that stumps the doctors. At 18, Costello left Kansas for Marquette University to pursue a degree in teaching, a vocation that continues to call the Roosevelt student today. “You can tell a lot about a person by the way they work with others,” said Cathy Evins, a Roosevelt lecturer in mathematics, who asked Costello to become an embedded classroom tutor after having him as a student in Math 110. At Marquette, Costello took some criminal justice courses that led to a growing interest in police work and the military, as well as an enlistment in the U.S. Army. 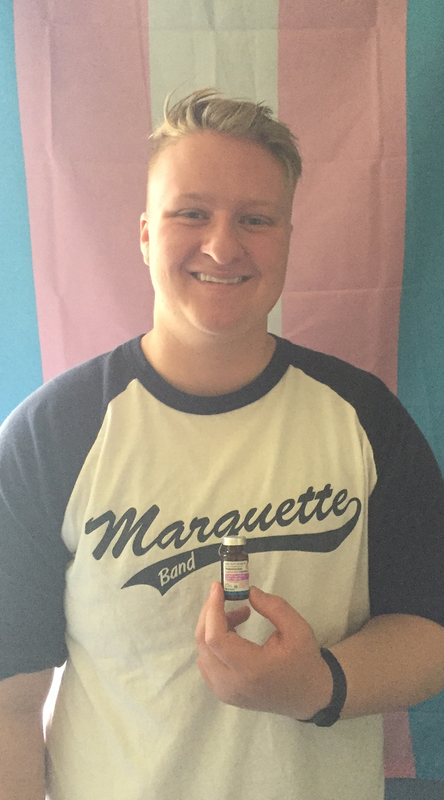 Then Costello attended a lecture at Marquette by Emmy Award-winning transgender actress Laverne Cox. It was an epiphany in which everything suddenly became clear. Day of Costello’s first drill weekend as a reservist, fresh out of basic training. Arriving for duty at Guantanamo Bay in February 2014, Costello was on edge — it was his first time traveling outside the United States, an experience he has since repeated by studying abroad at Roosevelt. “Beckett is not only curious and great at engaging others, he is also a natural community builder with a sense of humor,” said Roosevelt political science professor Bethany Barratt. She led a study abroad course last fall to England on urban human rights and Brexit. The experience was life-changing for Costello, who discovered new vistas as an aspiring policymaker. 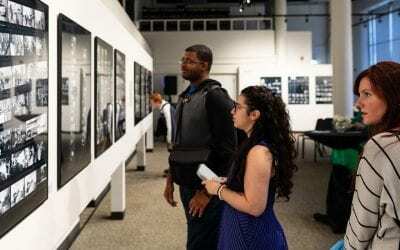 “The war on drugs and the mass incarceration that followed have always bothered me,” said Costello, who chose to compare for his final project the treatment of minorities in the British and U.S. penal systems. “What I learned is that solutions to societal problems don’t always have to come from our own backyard,” said Costello, who concludes the British are slightly better than Americans at addressing racial injustices tied to law enforcement. From the beginning, Costello’s approach to policing at Guantanamo was to treat inmates as human beings. That credo was tested in the very first interaction Costello had with a prisoner. Costello, who eventually worked every cellblock and tower in the C-shaped facility, was initially stationed near a two-way mirror. Through it, Costello could see the inmate in his cell with arm raised, a signal detainees use to indicate a need for soap, shampoo or other commissary items. However, this wasn’t a normal request. “I remember walking into the cellblock to see what the man wanted, and him looking at me and saying through an interpreter, ‘I request my freedom,’” Costello said. “After that, everyone there was cool with me,” Costello said. 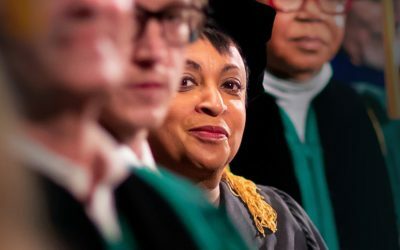 Over a decade had passed since 9/11, a time when Guantanamo gained notoriety for not only detaining the world’s top terror suspects, but also for its handling of detainees, who in some cases may have been tortured into revealing information through waterboarding. “My experience as a guard at Guantanamo Bay was probably not what most people think. Everyone assumes that torture goes on there, but it was just the opposite,” Costello said. He describes those under watch, including Osama bin Laden’s bodyguards and a majority of detainees from Yemen, as being remarkably “relaxed,” “docile” and “adapted” to the Guantanamo environment. With a short haircut and baggy uniform, Costello believes he came off to most at that time as being male, or at least gender neutral. 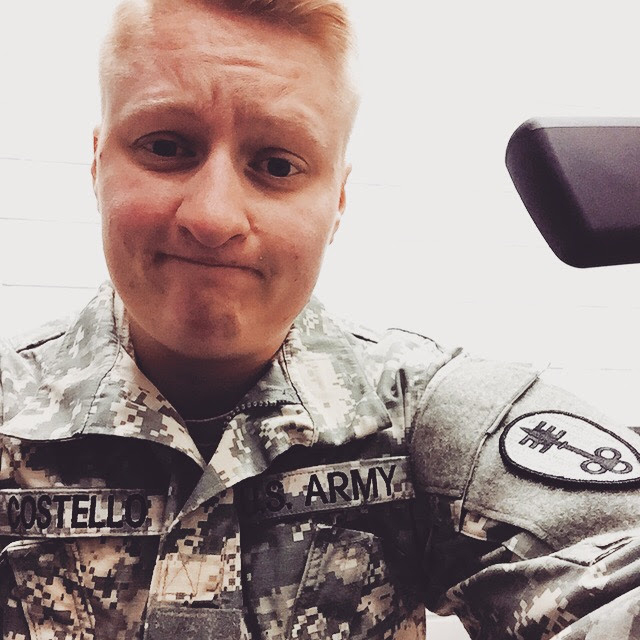 However, Costello did identify as female in official paperwork submitted to the U.S. Army. Requesting a discharge, Costello first came out as transgender with the squad leader, who brought the matter up the chain of command to the captain and possibly the lieutenant colonel, though Costello was never told for sure. He worried about a lack of confidentiality among his superiors in light of his admission. “There were those who sympathized with me and others who simply wanted me out. Overall, I felt I was no longer welcome,” said Costello, who received an honorable discharge on Christmas Eve 2015. A month later, Costello flew to Chicago for transgender services at Howard Brown Health Center. Enrollment at Roosevelt University followed approximately nine months later. 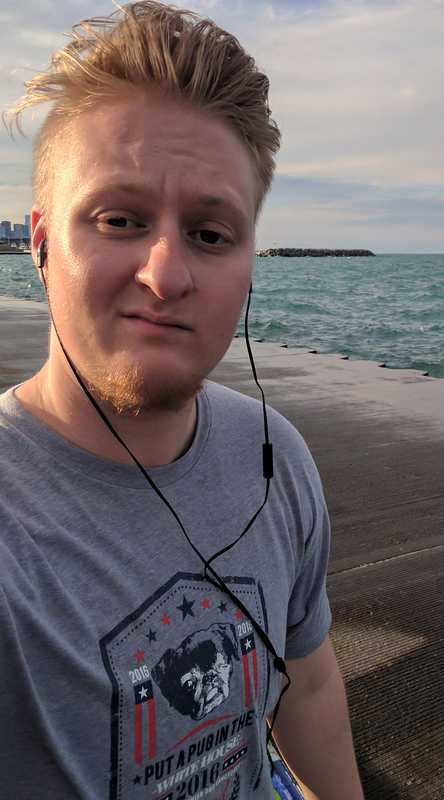 (from left): Costello after finishing his first vial of testosterone, four months into his transition; preparing for the 2017 Women’s March; Costello along the 31st Street Harbor, one of his favorite places in Chicago; a couple days after post-op from his chest surgery. 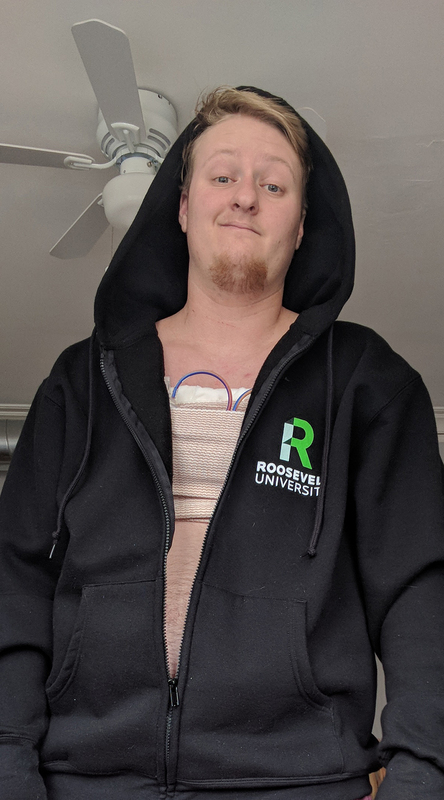 “I came here on a whim,” said Costello, who first signed up for one of Roosevelt’s allied health programs in radiography but later changed majors when the University’s mission of social justice came into better focus. “Everyone at Roosevelt has been welcoming,” said Costello, who credits his professors for propelling him to a bright future. With his study abroad class in their London hostel. One of three Roosevelt undergraduates competitively selected as an Obama Foundation trainee in Chicago last fall, Costello has developed an interest in the public arena as a result of the experience. “Seeing 149 other people in a room, all with hopes and dreams of making positive change, is inspiring,” said Costello, who has been both a Congressional intern and not-for-profit public policy intern in 2018. With a year until graduation, the best may be yet to come for Costello, who will take an environmental justice study abroad class over Thanksgiving to Vancouver, Canada, where students will learn about a community’s fight to keep fossil fuel development out of ecologically sensitive areas. Costello will also do research for a study on the use of tax increment financing funds by Chicago Mayor Rahm Emanuel’s administration. “Not too many students know what TIF districts are, let alone are willing to do a deep dive into TIFs,” said Stephanie Farmer, associate professor of sociology. Study findings, which could be unveiled in time for the 2019 mayoral election, may propel the transgender student even further — but how far, no one knows.